You would have had to have had a pretty wild and wonderful April Fool's joke to match the goings on in Kathmandu last Sunday, April 1st. 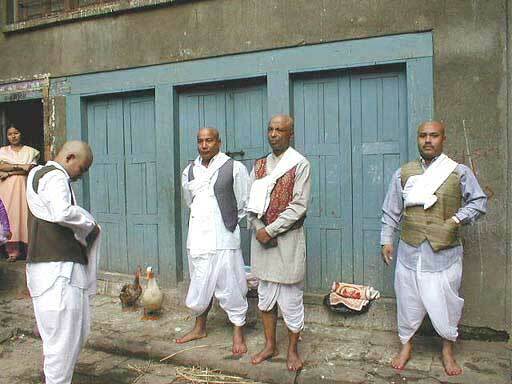 Everyone agrees that there is a Rato (Red) Machhendranath and a Seto (White) Machhendranath who are among the most revered divinities of the Kathmandu Valley. Here agreement ends. Some say they are two divinities; others think they are one in the same, just a color morph. Whether they are sisters or males with female aspects is not clear. Hindus see Seto Machhendranath as an incarnation of Shiva, who can bring rain, an important consideration as the country awaits the life-giving monsoons. For Buddhists, Seto Machhendranath is Aryavalokiteswar, who attained Buddhahood long ago. Tended by Newar Buddhist priests, Seto Machhendranath is worshipped by devotees of Shiva as the giver of longevity to children and the remover of sterility in women, the Ocean of Compassion. While in America we would have a presidential commission to resolve all of this high level ambiguity, in Nepal if bothers people not a bit. A very long time ago a Newar farmer unearthed the White Machhendranath and put it in the bin where he stored rice. To his surprise, the rice supply never decreased no matter how much rice his family ate. Hearing of this good fortune, the King had the statue installed near the public granary for the benefit of all. 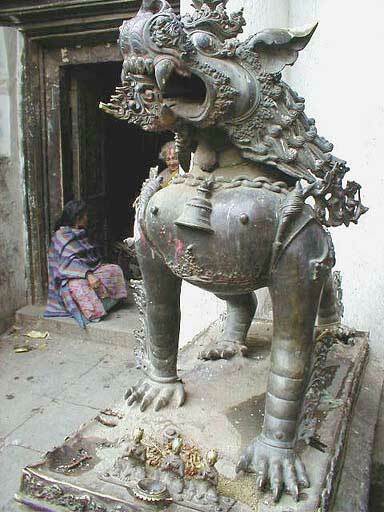 When the King of Tibet got word of these events, he had the idol stolen. But the Tibetans blew it. They did improper rituals, including animal sacrifices. This was a hard pill for the Ocean of Compassion to swallow, and the country was struck with an epidemic. 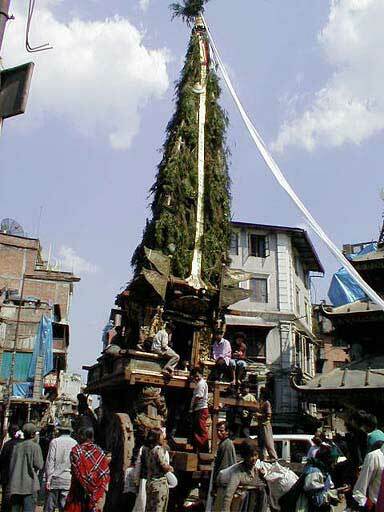 The King immediately returned the Seto Machhendranath and dropped it in a well at a place called Jamal (now right in the middle of Kathmandu on Durbar Marg, the main street leading to the Royal Palace). Someone drawing water found the idol. He was instructed in a dream where its temple should be and that White Machhendranath really does not like animal sacrifices. Photo A. A fierce snow lion guards the temple of White Machhendranath, located just as directed in the dream. 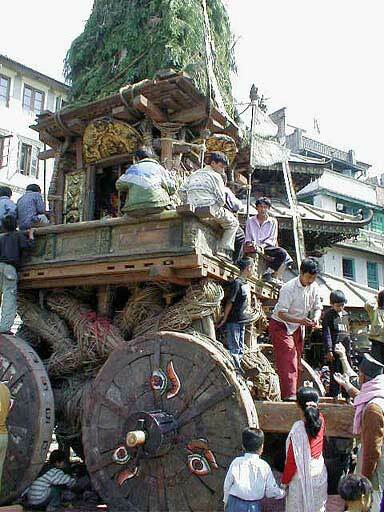 Photo C. For a week before the festival begins, men construct the processional chariot at Jamal on Durbar Marg, where the farmer found the idol and now perhaps the busiest street in Kathmandu. 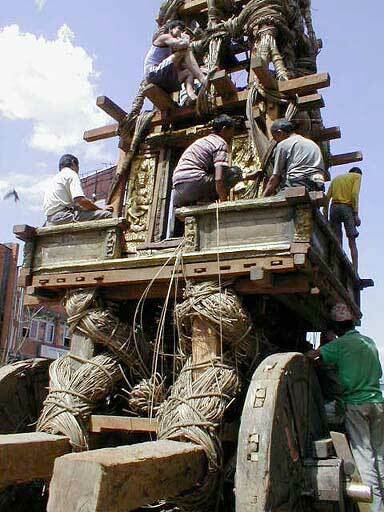 Photo D. Bamboo lashing, installed one strip at a time, holds the chariot together. 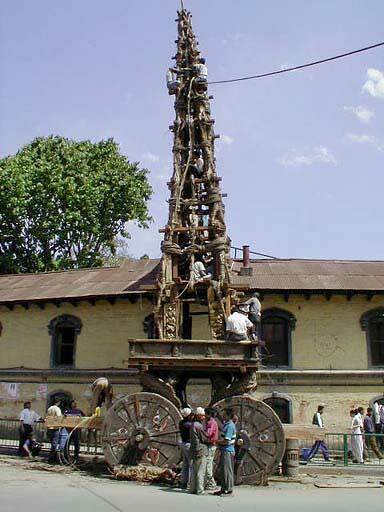 The six-foot in diameter wooden wheels are reused, but the towering steeple is constructed each year. The steeple is finished with a covering of pine branches and streamers. Photo E. Early Sunday, the temple courtyard began to fill with devotees, mostly women seeking favor with the Ocean of Compassion. Photo F. As the day moved on, the crowd grew and several bands began marching around the temple, mostly drums, cymbals, and gongs, led by a man with a 15-foot pole decked with flags and two yak tails. 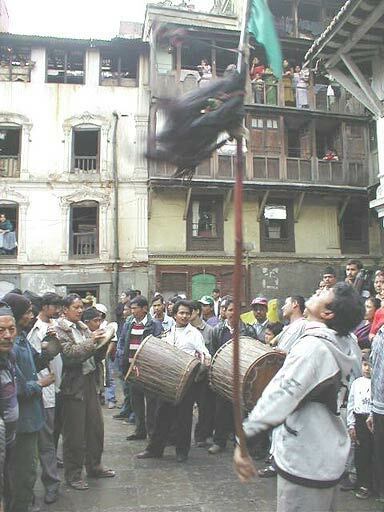 As he passed the pole around his body to the beat of the drums, the arched upper portion circumscribed figure eights. 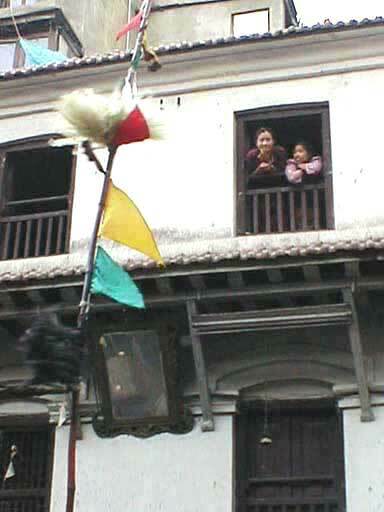 Photo G. Around the temple courtyard, people watched the twirling pole from their windows. Photo H. Nawar Buddhist priests charged with moving and guarding Seto Machhendranath did ritual cleansing of themselves and of the silver umbrella staff to be used in the procession. The two ducks know this means extra puddles in the courtyard. Photo I. While these preparations are underway for moving the compassionate Machhendranath, only two blocks away another festival is occurs, Chaitra Dasain. 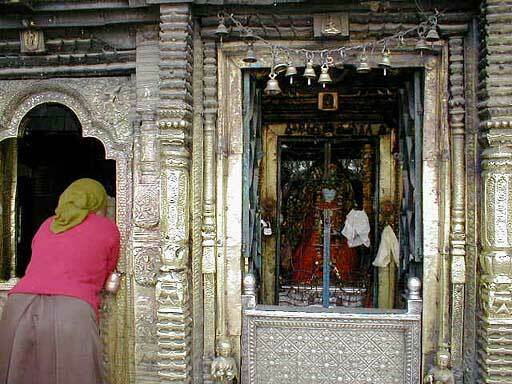 At the elaborate Taleju Temple, maybe a hundred water buffalo and goats are dispatched with one stroke of the sword each to please the bloodthirsty goddess Bhagwati, who adores a good animal sacrifice. Entry into the temple is highly restricted, and thus I did not witness the bloodletting first hand. However, my evidence of it is pretty persuasive. 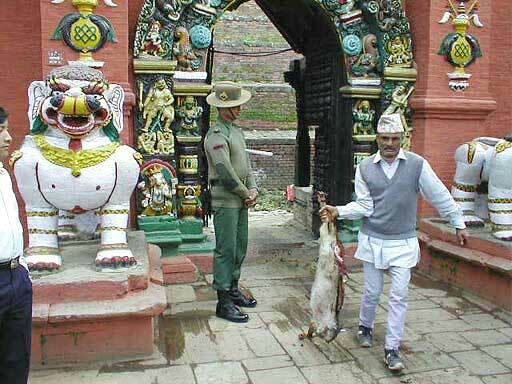 Overseen by the Nepal military, a headless goat departs the temple. Photo J. 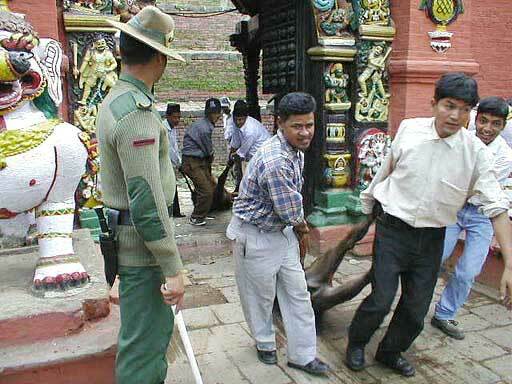 A procession of decapitated water buffalo leaves through the gate. Photo K. Slaughtered animals are sold as blessed meat. 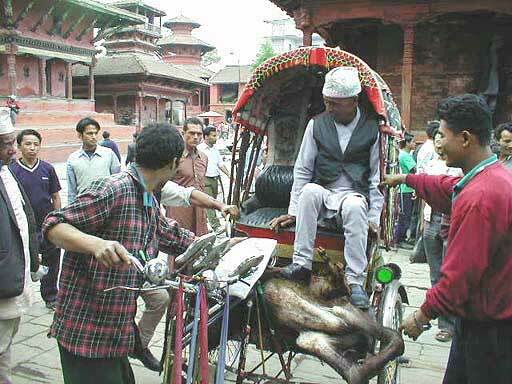 If you don't have a car and a taxi wont take your headless water buffalo home for you, what are you to do? Dozens of rickshaws lined up for the task. 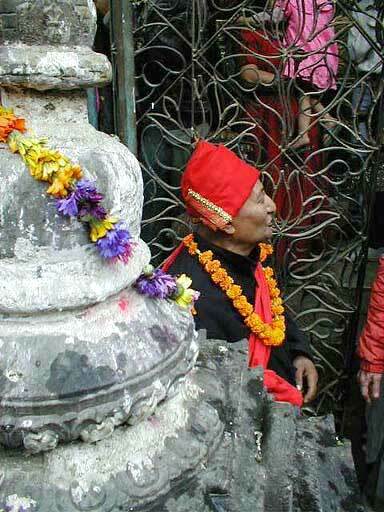 Photo L. Meanwhile, back at the home of the compassionate Seto Machhendranath, an honored person leaves the inner-sanctum of the temple after paying respects. Photo M. The Newar Buddhist priests remove the white idol from the inner chamber. 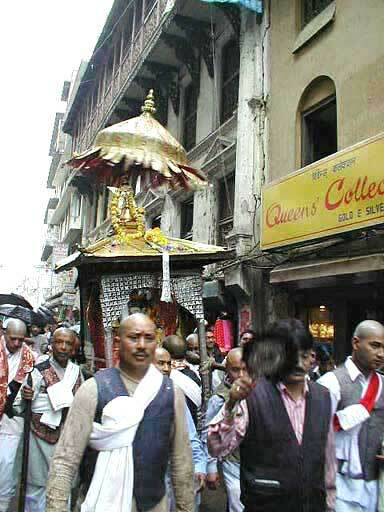 Photo N. Safely loaded into a khat, Machhendranath is carried through the narrow old streets of Kathmandu on the shoulders of the attending priests. A twirling gold umbrella follows the bringer of rain, along with bands, yak tail poles and thousands of devotees. The destination is Jamal, where legend has it that the figure was found in a well and where the chariot waits. Photo O. 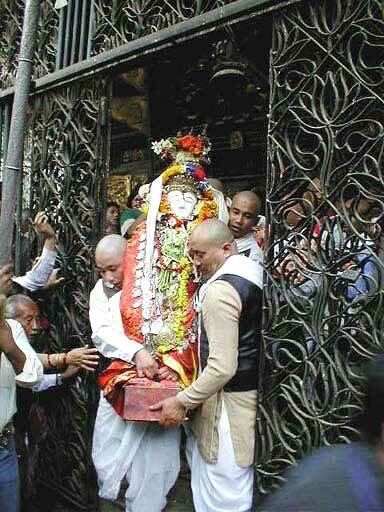 At about this time, the Living Goddess Kamari is supposed to leave her home and pay a visit to a nearby temple. Since I could not be both places simultaneously, I take it on faith that she did her duty. 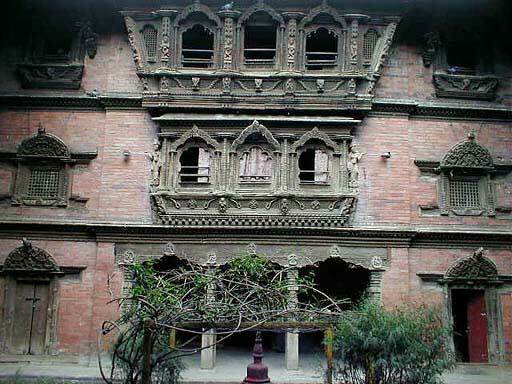 This is one of four magnificently carved 18th century facades in the inner courtyard of the Kamari Bahal. 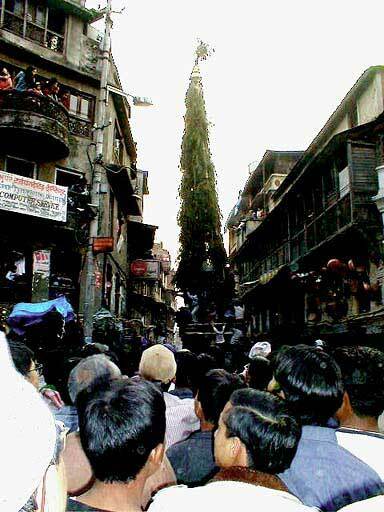 Photo P. After a riotous procession, Machhendranath boarded the chariot in the late evening and was whisked off, if you can call it that, by maybe 100 youths pulling the heavy cart over broken, cobbled streets. Here the chariot rests in Asan Tol after the first evening journey of maybe a quarter of a mile. Photo Q. 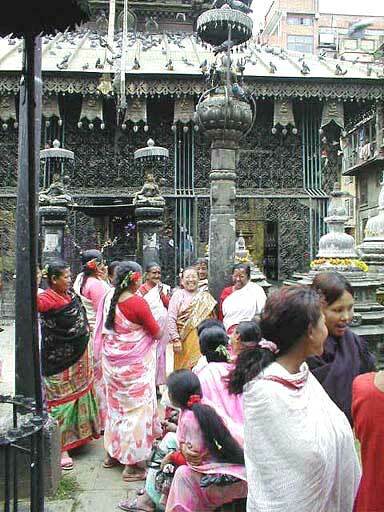 All day long people come to worship, seek blessings and pay respects to White Machhendranath resting in Asan Tol. As young people climb on the chariot, people throw up offerings, which the kids pocket or eat, and objects to be blessed, which the kids return for a coin. The sacred is not isolated from daily reality. Photo R. Without a steering device, the cart makes it way down streets barely wide enough for its passage. People cram to be near the idol. Residents remove power and phone lines to make way for the divine. The festival must last a minimum of three days but often stretches on for a week as wheels catch in the gutter, the steeple crashes into buildings and sometimes the whole thing collapses. And in Nepali fashion, all of this is accompanied by music, twirling yak tale poles, laughter and faith that greater powers will see Seto Machhendranath to his or her appointed destination.